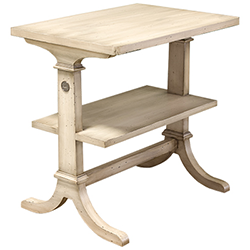 This classic tier table features hand-selected Knotty Pine veneers. The side supports reveal decorative molding. The supports terminate in splayed legs joined by a cross stretcher. The lower shelf allows for added storage. Two Bronze Putter Boy medallions are added to each end support. They are optional. Dimensions: Width: 28", Depth: 20", Height: 27.25"